Hi everyone, this week I had another opportunity to spend a night by the water with my sister. I wish we’d had more time as it’s a super lovely location and it was a little late by the time I arrived after work. I always take my cameras to the water but by the time I arrived there was a storm and it turned pitch black. However, I was determined to get photos so I got up extra early the next morning and my sister took this set of photos for me. I was planning to make an outfit of the day video but unfortunately I didn’t have the time this morning as I needed to get to work. I’ve never taken outfit pictures in the morning before this. As always, when I stay overnight in this location, I get the ferry to work the next day. It is always so fun and incredible to think that many people do that every day while the rest of us have to endure the chaotic buses and trains. You can watch the video I made last time I was in this location here. In terms of my outfit, I am wearing a playsuit by the brand Angel Biba. I adore playsuits but this is only the second one I own. It’s difficult to find playsuits that tick all the boxes but this one sure does. I love pattern mixing, especially stripes with florals, so it is a really amazing design. I also like how the shorts are flared and roomy so it looks like a skirt; I much prefer this design in comparison to playsuits with the more fitted shorts. My bag is a new addition to my wardrobe from the recent Guess sale. I have no self control when it comes to Guess bags, I just can’t help myself. I love the structured design and the colour of this one. This entry was posted in Angel Biba, Guess, Outfits. Bookmark the permalink. What a cute look! Orange skirt and bag are perfect and the top with stripes is fantastic ! Ooh I'm adoring this playsuit – the print-mixing is just perfect! oh, this outfit is so pretty and girly;) You look wonderful in these pieces, each of them confirming your individual style and personality:) I can't but mention how the area is beautiful, so picturesque! Such a great post turned out, I enjoyed it very much! 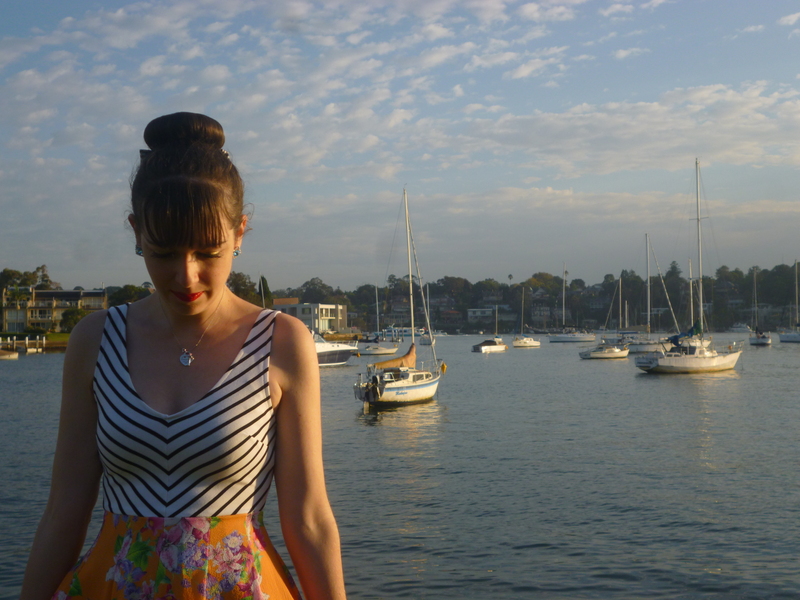 Such a lovely setting, Imogen:) I wish I live close to the water. And yay for the playsuit! Imogen, these pictures of the water are so lovely, and what a fun outfit you're wearing while relaxing and appreciating nature. I hope you had a great time visiting with your sister. Beautiful outfit and scenery by the water and boats. I'm not much into skirts but when they look like that… cute. Such a cute look! Lovely skirt and perfect mix of prints! I love the outfit! Glad you managed to get the shots, even if it did mean you had to get up early! I love mix pattern on pattern. Very beautiful look. Love this dress. I am always one for a little pattern mixing and this looks great. What a gorgeous backdrop! 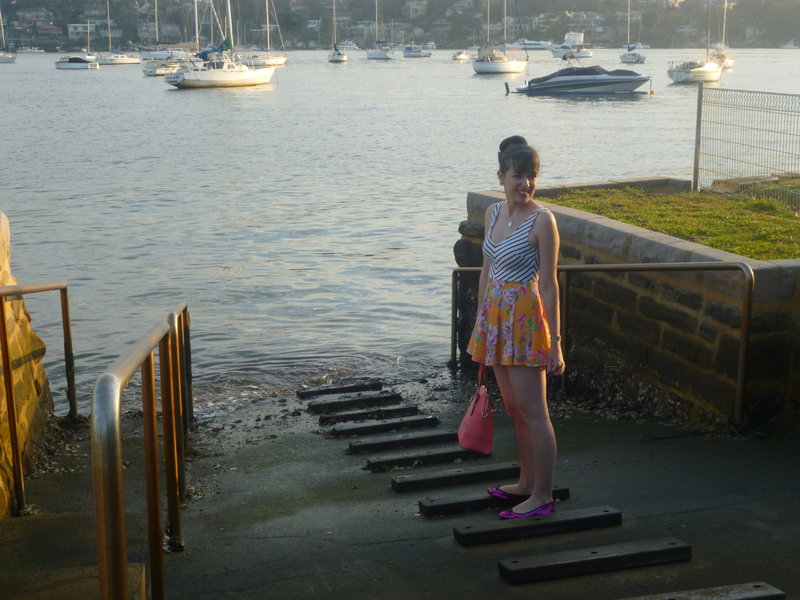 I also love playsuits, there are so many in Australia – you must be spoilt for choice! 😉 I particuarly like playsuits by Reverse and Spell Designs!